Tom Muir is Distinguished Professor of the Arts at Bowling Green State University, where he is head of the Jewelry and Metalsmithing area in the School of Art. He received his MFA from Indiana University, Bloomington, and his BFA degree from Georgia State University in Atlanta. 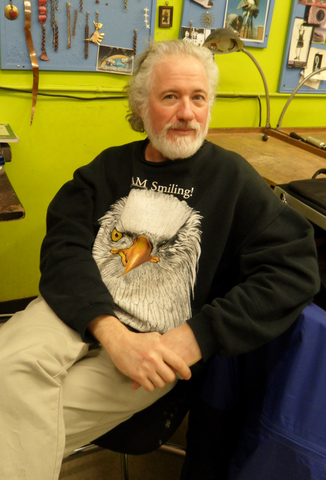 Mr. Muir has lectured and taught widely, holding positions at universities and craft schools around the country. His award-winning work has been published and exhibited extensively in art, craft and design exhibitions. Collections include the Art Institute of Chicago, Renwick Gallery of the National Museum of American Art, Smithsonian Institution and The White House Collection of American Crafts, National Museum of American Art, Smithsonian Institution. He is the recipient of an Arts Midwest/National Endowment for the Arts Regional Artist Fellowship, Michigan Council for the Arts Fellowship, and numerous Ohio Arts Council Individual Artist Fellowship Awards. In 2009, Tom received the Outstanding Achievement Award from the Ohio Designer Craftsmen for having made a major contribution to craft in Ohio. Bryan Petersen received his B.A. in Metalsmithing at Montana State University in Bozeman, MT, and an M.F.A. in Metals, from East Carolina University in Greenville, NC. 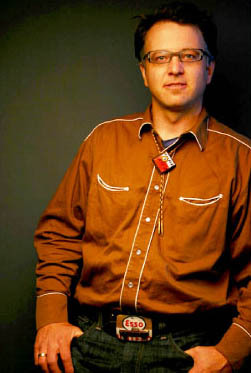 He is currently an Assistant Professor of Art teaching Beginning and Advanced Metalsmithing classes at Montana State University. He has taught at The Arthur Morgan School, Georgia Southern University, Arrowmont, Ghost Ranch, and The Bear Canyon School of Art and Craft. His work is published in Lark books, Fabulous Jewelry From Found Objects, Hollan Publishers book, Mixed Media Collage Jewelry: New Directions in Memory Jewelry, A&C Black's Jewellery From Recycled Materials, and Lark Books Iron Wire Jewelry.